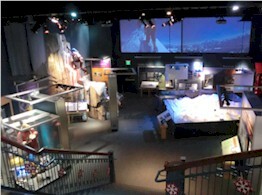 The Bradford Washburn American Mountaineering Museum is the first and only museum in the U.S. dedicated to the heroism, technology, culture and spirit of mountaineering. Learn about the world of mountain and rock climbing. Located at 10th and Washington. Buffalo Bill’s Grave is at the top of the mountain. He is said to have chosen the spot for its incomparable view. 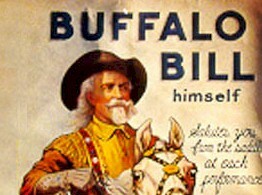 Almost 100 years after his death, the showman Buffalo Bill still exerts a sense of romance about the Old West. 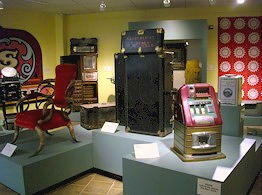 This museum exhibits his show posters, costumes, and tells of his long and colorful life. This museum wins the prize for the biggest artifacts in town! They have a fascinating collection of old trains —engines, cabooses, passenger cars —dating from the 19th century. 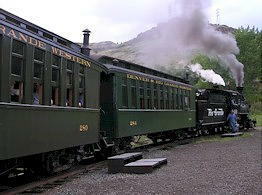 They offer train rides around the museum grounds every weekend. 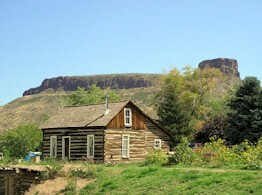 The Clear Creek History Park gives a glimpse of mountain homestead life. Comprised of nearly a dozen historic structures relocated from a ranch in Golden Gate Canyon, the three-acre history park is situated picturesquely on the south bank of Clear Creek. Today, visitors can explore the historic structures, visit with the heirloom breed chickens, and enjoy historic demonstrations during special events. 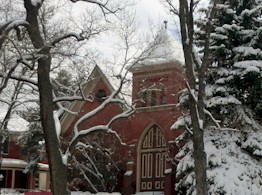 A number of Golden-area residents attended school in the one room Guy Hill School House. The Reynolds cabin, root cellar, blacksmith shop, and chicken coops are all relics of pioneer times. The Park is free and open to the public. During the summer, professional interpreters are on site to offer fun and engaging activities. 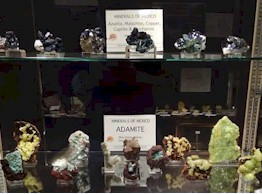 Thanks to the generosity of many Mines graduates over the years, the Colorado School of Mines Geology Museum offers an extraordinary collection of specimens in a large and beautiful museum. Don’t miss their simulated uranium mine. Admission is free. 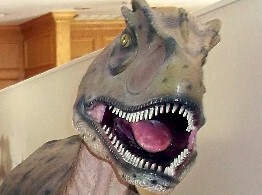 Located a few miles south of Golden is a world-renowned “outdoor museum” dedicated to the dinosaur discoveries made in the Golden area. Many dinosaur fossils have been extracted from this area, and fossilized footprints are easy to spot. The museum includes a Visitors’ Center and trails filled with interpretive signs to help visitors understand what they’re seeing in the rock formations. One (steep!) block south of the shopping district is the Foothills Art Center. Foothills is a highly-respected gallery with juried exhibits that rotate throughout the year. They also offer classes and lectures. From mid-November until New Years Eve each year they host a holiday art market which offers great, unique arts and crafts. Their gift shop is open year-round. This Museum was created in 1938 and has been collecting and interpreting interesting Golden artifacts ever since. They have a fabulous collection of Coors Porcelain, Victorian home furnishings, and pioneer goods, as well as dioramas and paintings done by the Works Progress Administration (WPA). 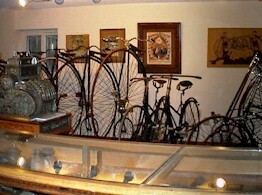 Golden Oldy Cyclery is a private “home museum”. It is called “The Sustainable Museum of Sustainable Transportation” for two reasons: 1) It honors the Sustainable Personal Transportation of the 19th & 21st Centuries – Victorian Bicycles & Tricycles and Plug in Vehicles; 2) The home is a converted 1970’s energy hog, now a Net Power Plant through super-insulation and solar collection. It houses the staff and grows staff food in the former lawn and new sun rooms. The fascinating collections of antique bicycles, 19th century cycling literature (over 120,000 pages), and cycling photo galleries are professionally displayed. Visits are by appointment or during Public Open Houses. 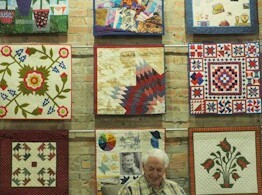 The Rocky Mountain Quilt Museum is a must-see vacation stop for quilters and quilt enthusiasts from across the country and around the globe. Housed in a charming 1905 building, RMQM hosts quarterly exhibits, tailored tours, and programs for adults and youth. For the researcher and quilt enthusiast, the Sandra Dallas Library contains over 3000 volumes featuring out-of-print literature, technique resources, historic patterns and research documents. The museum shop features unusual gifts and the work of local artists.